1. Cover FX CC Cream (c/o) - While this is the newest addition to my alphabet cream collection, it quickly rose through the ranks. Great coverage, lightweight feel and a built in primer - I'm not sure this CC cream could be any more perfect. An added bonus are the skincare properties that help to address and treat the signs of aging on the skin. So while my night cream is helping me stay young forever while I sleep, now my makeup can do the same during my daily activities. 2. 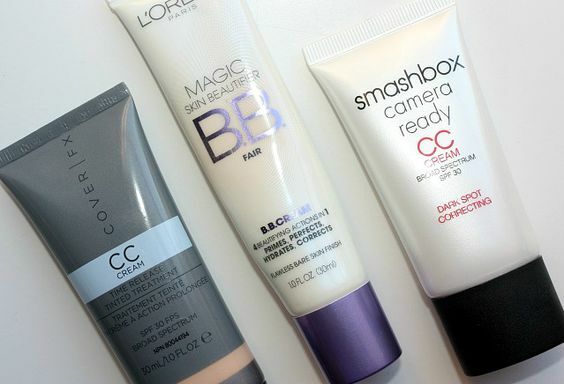 Loreal Magic Skin Beautifier BB Cream - This was my first BB/CC cream ever purchased and it still remains one of my favorites of all time. The texture is unique to say the least, with a completely white cream that has a grainy-like feel that self adjusts to my skin tone. The encapsulated pigments help to deliver the beautifying properties to hydrate, correct, even and perfect. And the finish on my skin is perfectly matte and can be worn either alone or under another foundation. A super effective product at a drugstore/affordable price - is there anything better? I think not. 3. Smashbox Camera Ready CC Cream - Once the CC creams began to emerge onto the beauty scene, this was the first one that I had the opportunity to try and fell in love with instantly. The texture feels silky and when applied (for me) had an incredibly hydrating and refreshing feeling. How it does that? I am not quite sure, and I know the color correcting, priming, neutralizing properties are worth mentioning but frankly the standout feature was the way it felt on my skin. And with all that refreshment, you would think it may appear dewy or shiny but for my oily skin it dried down to a natural matte finish and helped to control oil throughout the day. Not sure it gets any better than that. Haha, I love the term Alphabet Creams. I also really enjoy that L'Oreal one as it works very well for my oily skin. I have been looking into that CoverFX one so glad to hear that it is a good one. The entire Loreal magic line is pretty amazing. You should try their Loreal Magic Liquid powder foundation - it is great!